Fred and George. Filme Icontest, Theme: Brown. 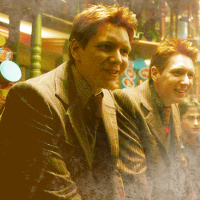 Images in the Fred Weasley club tagged: photo harry potter half blood prince fred weasley george weasley. This Fred Weasley icon might contain geschäftsanzug and business-anzug.